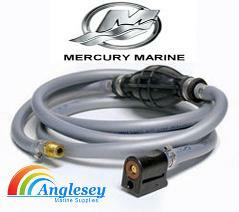 Anglesey Marine Supplies for portable and fixed boat fuel tanks and fittings, boat fuel lines, filters and separators. 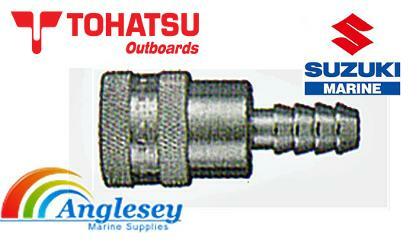 All types of outboard fuel connectors supplied for Mercury, Honda, Omc etc. 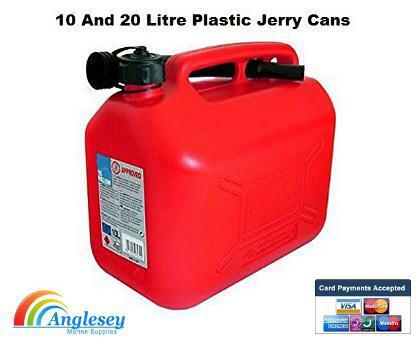 Jerry cans and boat fuel carriers in stock. 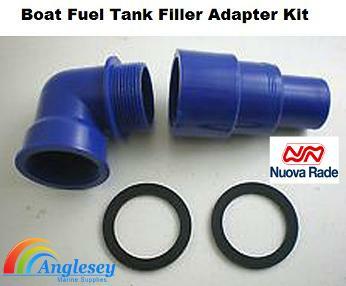 Water fuel separators supplies for Mercury, Mariner, Mercruiser etc. 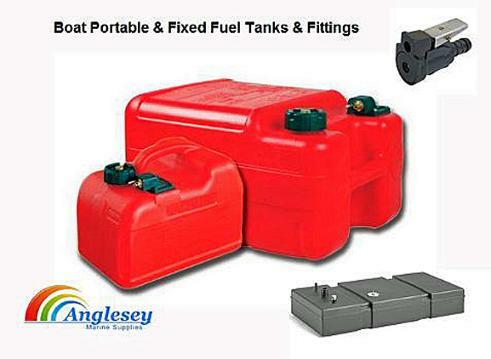 Now stocking a wide range of fixed boat fuel tanks to suit all boats, canal and narrowboats. 3 Gallon U.S (11.3L) Portable Boat fuel tank with fuel adapter and vented cap with built in fuel gauge. Same style and size as Honda, Mariner, Mercury etc. 6 Gallon U.S (22.7L) boat fuel tank portable complete with fuel adapter and vented cap. No fuel gauge. 6 Gallon U.S (22.7L Boat Fuel Tank complete with fuel adapter and vented cap. Built-in Fuel gauge. 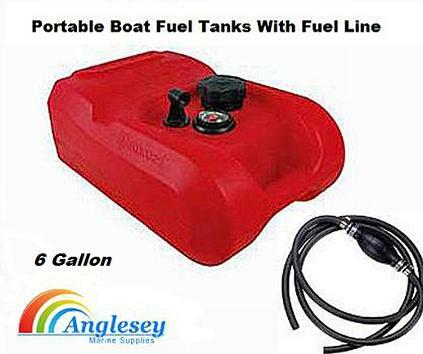 3 gallon portable boat fuel tank with boat fuel line. 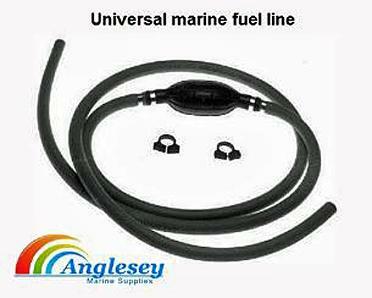 The universal boat fuel line comes ready fitted to the portable boat fuel tank ready to go. 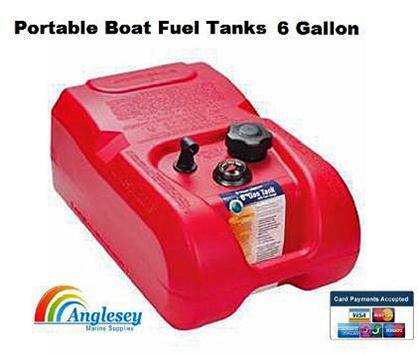 6 gallon portable boat fuel tank with boat fuel line. 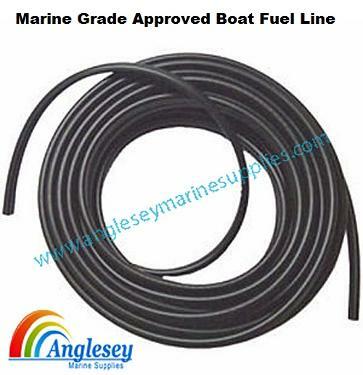 The universal boat fuel line comes ready fitted to the portable boat fuel tank ready to go. 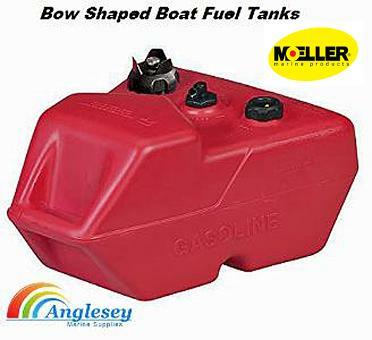 The bow shaped boat fuel tank has a 6 gallon capacity. Attwood large portable boat fuel tank 12 gallon capacity. 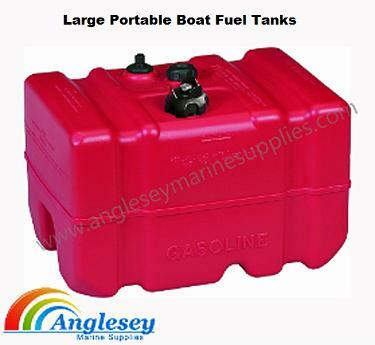 The large portable boat fuel tanks is fitted with a capacity gauge. Dimensions are 58cm long, 36cm wide and 37cm height. 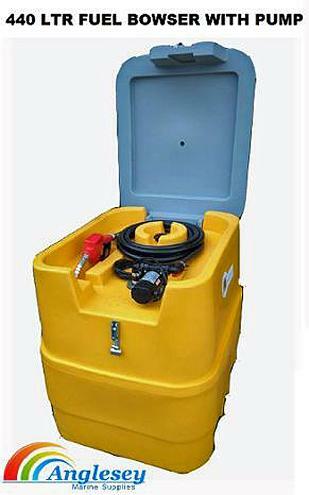 The large portable boat fuel tank is EPA Compliant. 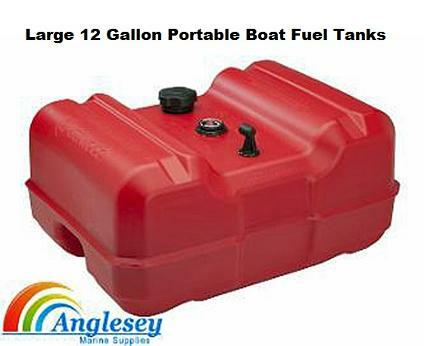 Large portable boat fuel tanks, available in two different sizes however both with a huge 12 gallons capacity. Dimensions are (Type A) 50.8cm Length x 35.6cm Width x 38.1cm Height including height of cap (as shown on left) Second one available is (Type B) Dimensions 61cm Length x 45.7cm Width x 27.3cm Height Including height of cap. Economy red plastic jerry can boat fuel carrier with external spouts for easy pouring. Specially designed for transporting and the storage of petrol, diesel etc. Please use drop down bar for size choice of plastic fuel carrier. 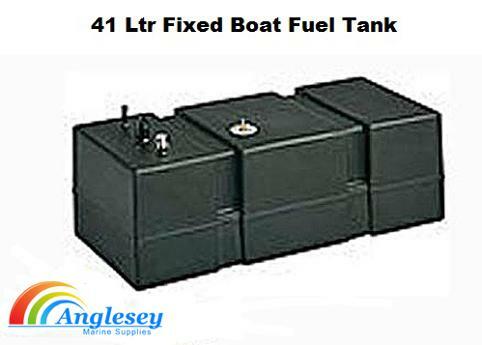 41ltr capacity marine, fixed boat fuel tank manufactured from grey polythene. Complete with integral vent and fuel pipe connector. 50cm long x 35cm wide x 30cm height. 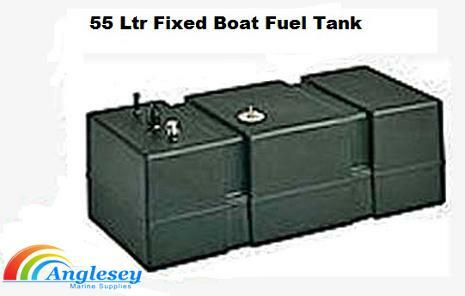 55ltr capacity marine, fixed boat fuel tank manufactured from grey polythene. Complete with integral vent and fuel pipe connector. 65cm long x 35cm wide x 30cm height. 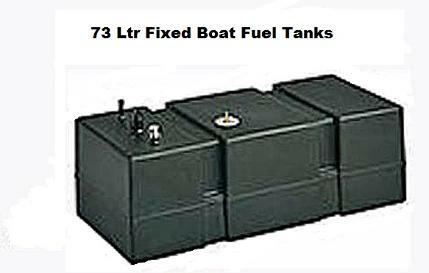 73ltr capacity marine, boat permanent fixed boat fuel tank manufactured from grey polythene. Complete with integral vent and fuel pipe connector. 110cm long x 35cm wide x 22cm height. 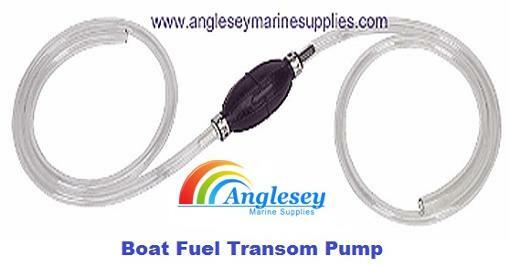 Anglesey Marine Supplies now supplying a range of tempo fixed boat fuel tanks installation fuel tanks ideal for boats, motor-homes kit cars, boat builders etc. Manufactured from polyethylene, with a one piece construction. All tanks are fitted as standard with fuel sender units and are fitted with all necessary take-offs for fuel, vent and filler adaptors. Deck filler is 1 1/2” ( 38mm. ) CE approved. 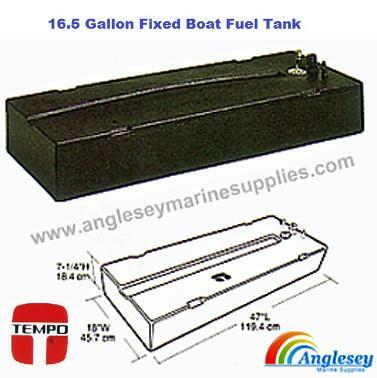 Tempo fixed boat fuel tank 16 gallon. ( 62.5 lt ) c/w fuel sender unit and has all necessary remote adaptors. 18” wide x 36” long x 7” high. 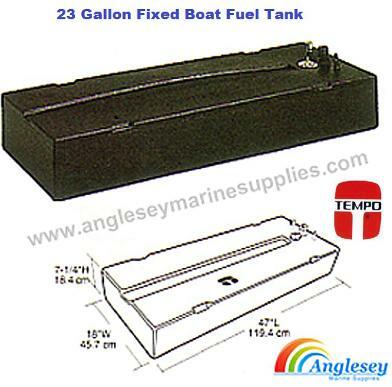 Tempo fixed boat fuel tank 23 gallon. ( 87.1 lt. ) c/w fuel sender unit and has all necessary remote adaptors. 18” wide x 47” long x 7 1/4” high. 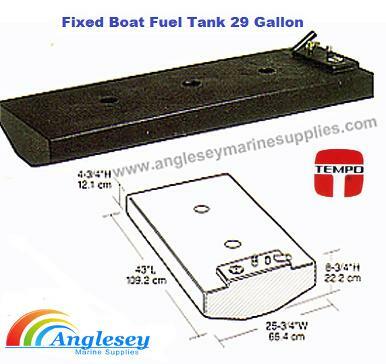 Tempo fixed boat fuel tank 29 gallon. 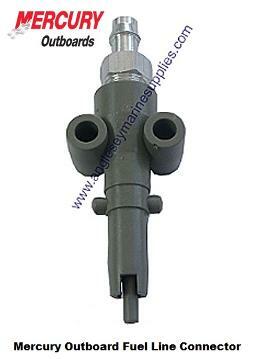 ( 109.1 lt. ) c/w fuel sender unit and has all the necessary remote adaptors. 43" Length, 25 3/4" Wide, 8 3/4" High. 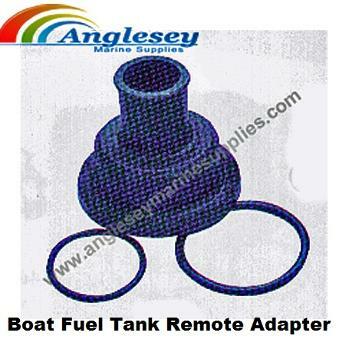 Remote fitting kit boat fuel tank adapter for above fixed boat fuel tank. Consisting of Boat fuel tank adapter and breather. Used to enable the filler to be placed elsewhere. 90 deg Boat fuel tank elbow adapter remote fitting kit for fixed boat fuel tank. Consisting of boat fuel tank adapter and breather.Used to enable the boat fuel tank filler to be placed elsewhere. 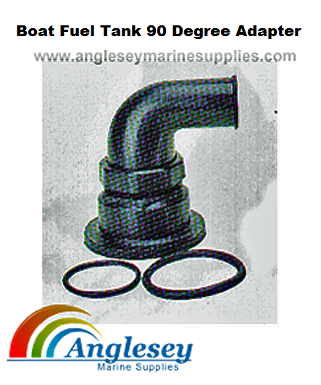 Fixed marine boat fuel tank filler cap, available in either 38mm or 50mm (11/2" or 2") i.d hose. 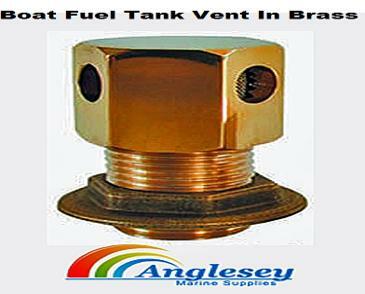 Supplied with an assortment of labels (Fuel, Diesel etc) , We also stock a brass boat fuel tank filler. A Chrome plated metal boat fuel tank vent for use on the permanent fixed tanks, Suitable for vent hose 12-16mm. Available in either straight or 90 degree angle. A decorative polished brass boat fuel tank vent, 3/4" outside diameter. Had a touch of class to your vessel. 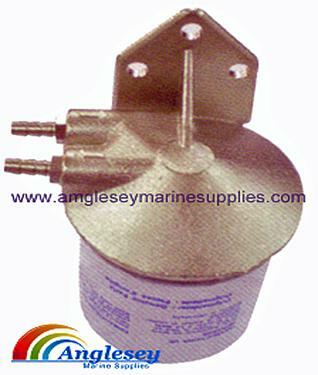 We stock a range of boat fuel tank vent for fixed boat fuel tank. 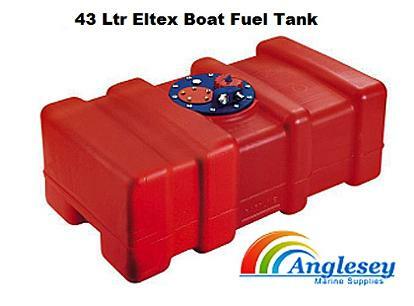 The “Eltex” boat fuel tank 43 ltr is ideal for boats and motorhomes. Can be used as portable or fixed installation. Fitted with boat fuel tank vent fuel take-off and filler. Can be fitted with remote fuel sender unit and boat fuel tank filler adapter for fixed position. 65cm. long x 35cmcm. wide x 23cm. high. 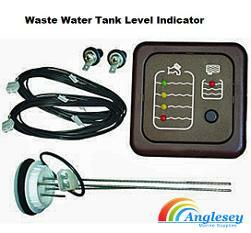 Economical waste level indicator, boat water tank level indicator consists of sender unit to fit in tank and holds 3 s/s probes. These indicate 3 levels. A panel to indicate level in tank is coupled together by a cable kit. 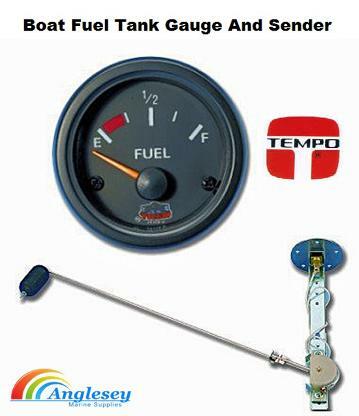 “Tempo” round dial black faced boat fuel tank gauge and sender comes with fuel sender unit. All packaged together forming a complete easy to fit kit. Temp boat fuel tank gauge. Universal reinforced, alcohol resistant boat outboard fuel line hose assembly, with a large primer bulb fitted, hose is 8mm inside diameter. 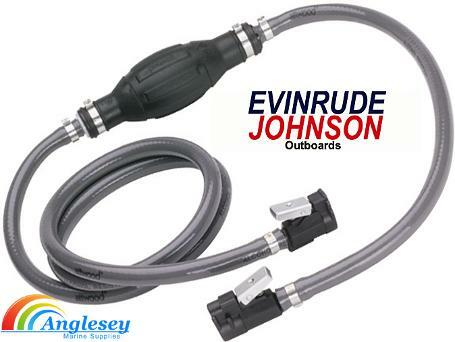 "OMC" Johnson Evinrude outboard fuel line hose assembly, fitted with end connectors and a priming bulb. Boat fuel line complete. Mercury outboard fuel line hose assembly fitted with metal connectors, also fitted with a priming bulb. 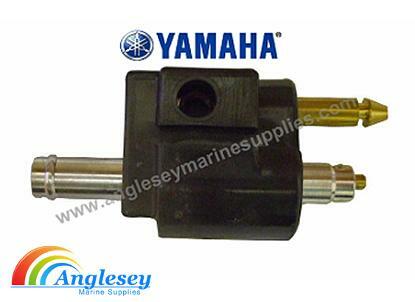 Yamaha Outboard fuel line assembly fitted with end connectors and priming bulb. Honda outboard fuel line assembly, fitted with end connectors and a priming bulb. 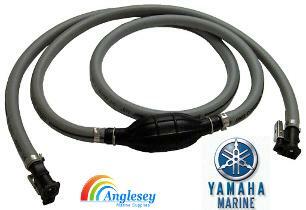 Approved marine grade outboard fuel line hose, reinforced and alcohol resistant. Sold in two sizes 5/16" (8mm) and 3/8" ( 10mm). Prices are per metre, Please use drop bar menu for choice of boat fuel line hose and enter metres required as quantity. Four different sizes of marine boat outboard fuel line priming bulb to choose from, worth changing as part of your annual boat maintenance checks. Also carry a spare as failure results in outboard malfunction. Easy to change. 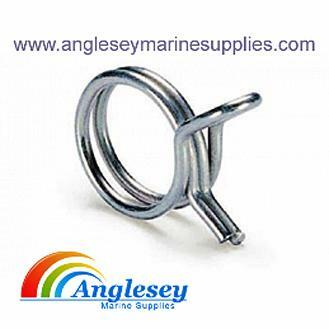 Marine grade 316 stainless steel fuel line hose clips clamps, Spring type, very easy to fit. 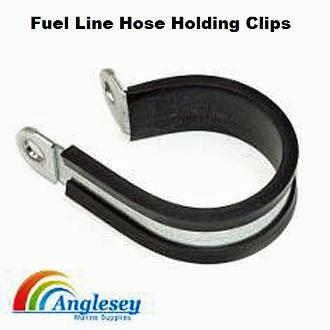 Boat fuel line pipe holding r clips, for fastening boat fuel line hose safely and securely. Saves the boat fuel line from scuffing on nearby objects. Range of sizes. 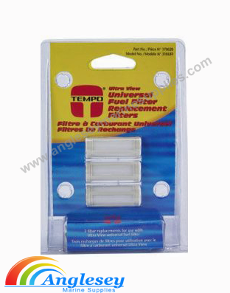 Tempo ‘’Ultra’’ view in line boat marine clear boat fuel filter, includes 6mm, 8mm, and lOmm. 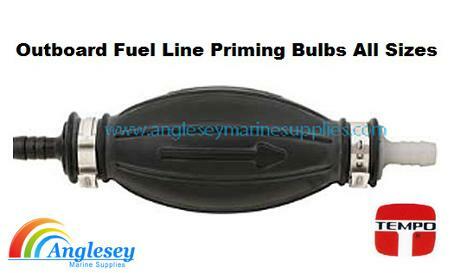 barbs for easy fitting to any boat fuel line. Has visible removable boat fuel filter. (extra filters available below). Three pack of spare replacement boat fuel filter for the tempo boat marine and outboard universal fuel filter sold above. 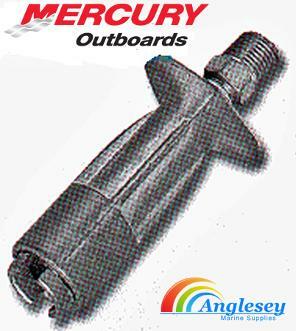 Male and female mercury outboard fuel line connector fitting fuel end connectors for Mercury outboards. 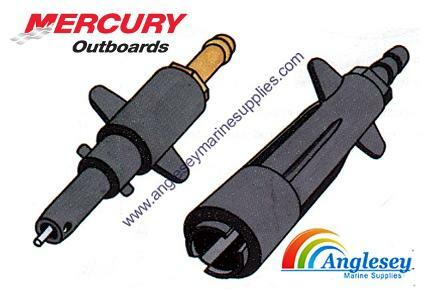 Mercury outboard fuel line connector. Manufactured from plastic. Please use choice bar for type. 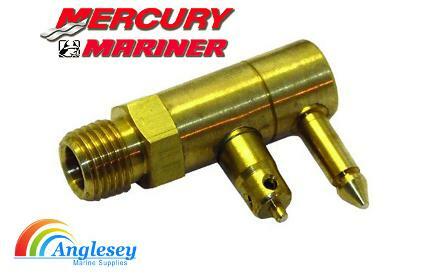 Mercury outboard fuel line connector engine end. Manufactured from high density plastic with a 3/8" barbed brass ferrule. New type mercury mariner outboard fuel line connector 1998 onwards. 4hp to V6 motor plus force outboard engines 1993 onwards over 40hp. Female Mercury outboard fuel line connector. 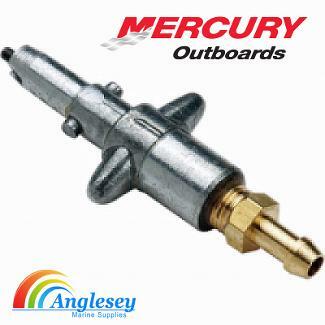 Quality mercury outboard fuel line connector from Anglesey Marine Supplies. Male Mercury outboard fuel line connector. 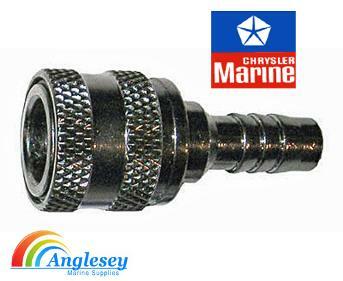 Quality boat fuel tank fuel line connector from Anglesey Marine Supplies. 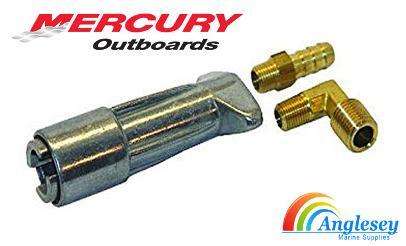 Mercury outboard fuel line connector. 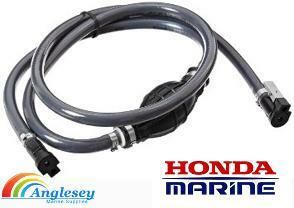 Boat fuel hose also sold on this page along with stainless jubilee clips. Boat fuel tank connector. 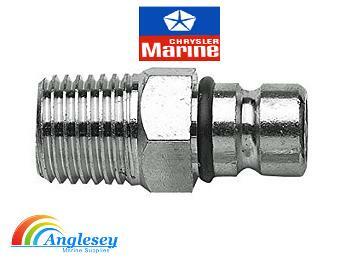 Chrysler outboard fuel line connector male fitting. Honda outboard fuel line connector engine old type honda outboard fuel line connector. 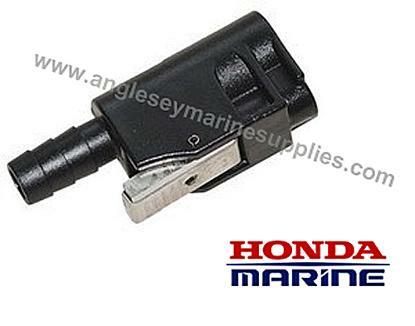 New Honda outboard fuel line connector with rectangular locking post. 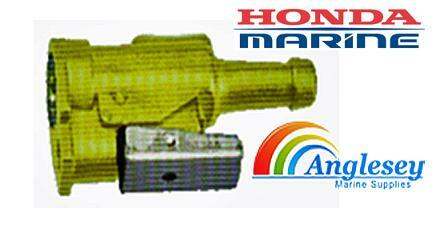 New type Honda Tohatsu outboard fuel line connector , female fuel line connector for Honda outboard engines and Tohatsu outboard motors. 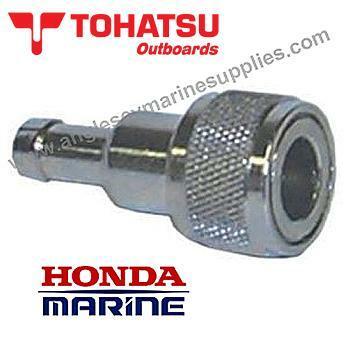 Honda and Tohatsu outboard fuel connector male fitting. 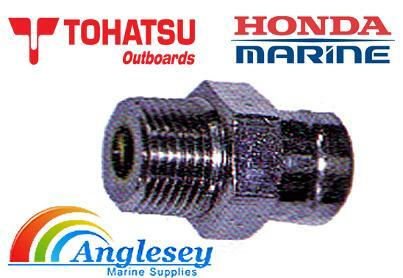 New type honda tohatsu outboard fuel line connector. Male boat fuel line connector for Honda and Tohatsu outboard boat engines. 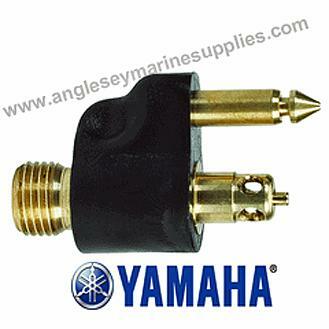 Yamaha outboard fuel line connector nylon and brass male fuel tank connector. 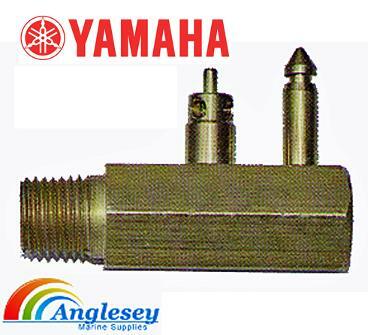 Yamaha outboard fuel line connector, manufactured from brass. Connectors Honda outboard engines to boat fuel tank. 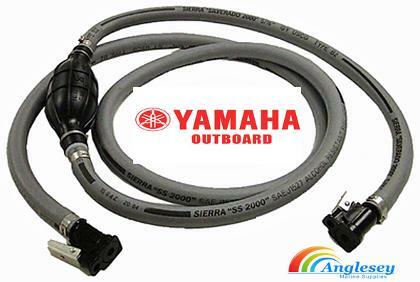 Yamaha outboard fuel line connector, to fit yamaha outboard boat engines connectors to fit boat fuel tank. 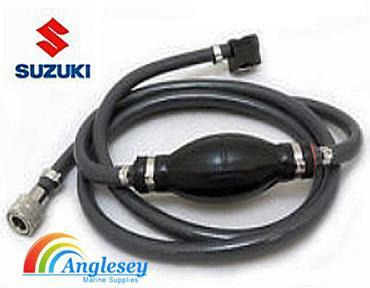 Suzuki Honda outboard fuel line connector, new type recently introduced. Large Suzuki Tohatsu outboard fuel line connector. Female boat fuel line connector for Suzuki and Tohatsu outboard boat engines. Large Suzuki Tohatsu outboard fuel line connector fitting, outboard motor engine male fuel line connector fitting for Suzuki and Tohatsu outboard boat engines. 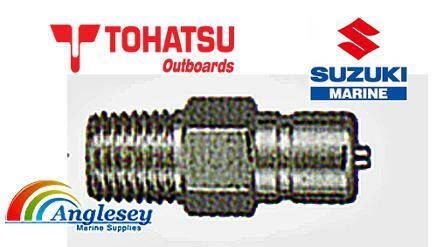 Tohatsu outboard fuel line connector. 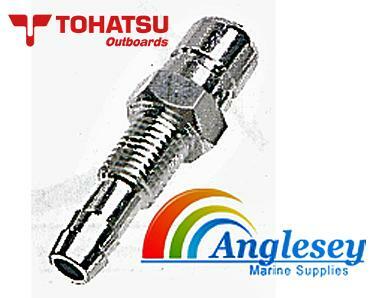 To connect Tohatsu outboard engines to boat fuel tank. 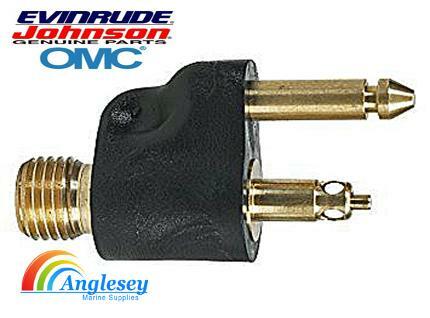 OMC male brass boat outboard fuel line connector tank connector. To connect to boat fuel tank. OMC male johnson evinrude outboard fuel line connector. To connect to boat fuel tank. 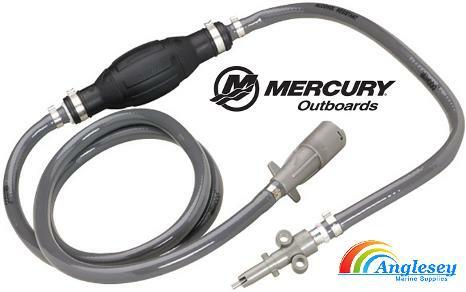 Connects the boat fuel tank to the boat outboard engine fuel line. 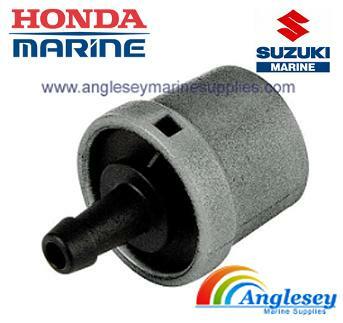 Bulkhead mounted boat Fuel filter for Volvo, Mercruiser, OMC and all types of petrol engines, with disposable cartridge. Bulkhead mounted boat engine fuel filter. 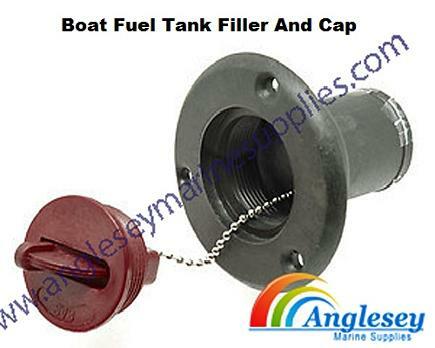 Boat fuel filter water separator filter complete with housing. 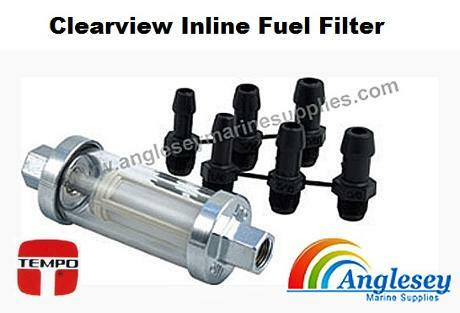 Supplied fitted with two 3/8" 10mm barbs ready to accept fuel line.Will fit majority of Mercury, Mariner, Mercruiser engines. OEM 35-802893Q4. Boat engine outboard fuel filter with housing. 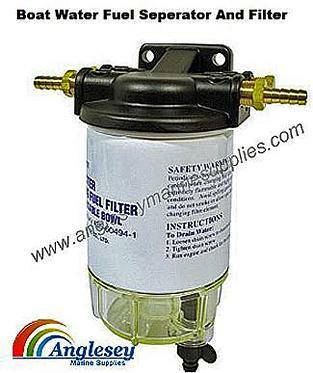 MF 10 replacement filter only to fit our complete boat fuel filter sold above. OEM part number 35-802893Q01. Buy more than one and save on bulk buying. 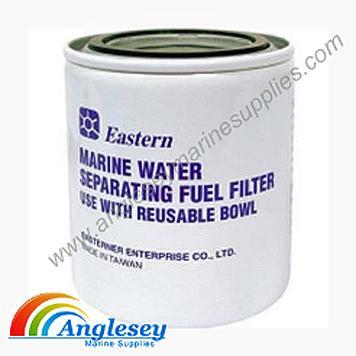 Marine boat fuel filter water separator. Boat Exhaust flap guards to cover the boat engine exhaust outlet and prevent water ingress. 63mm. - 75mm. diameter. 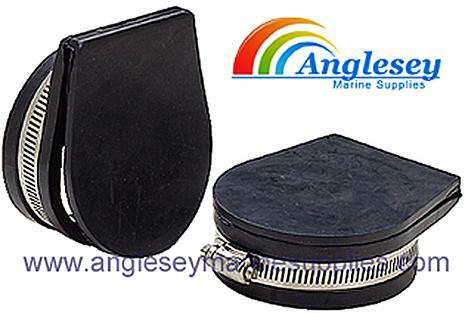 Quality boat exhaust flappers boat exhaust outlet covers. Boat fuel syphon pump. Rubber bulb pumps all types of liquids including diesel and petrol. Simply place the end of tube into the fuel tank and the other into the receptical and prime with the bulb. 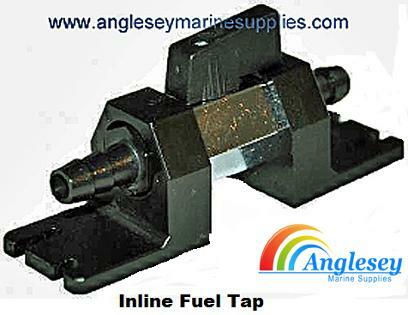 Boat inline fuel tap with mount, takes 8mm. or 10mm. boat fuel line. Ideal for boats, motorhomes, caravans and kitcars. THE DIESEL BOWSER SIZE IS 940MM LONG X 760MM WIDE X 840MM HIGH.